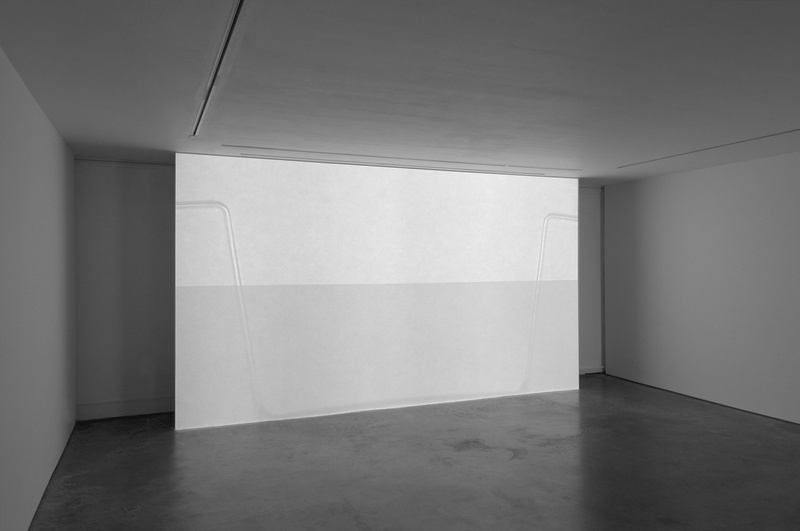 Elsewhere in the gallery, there were more absences to be found. 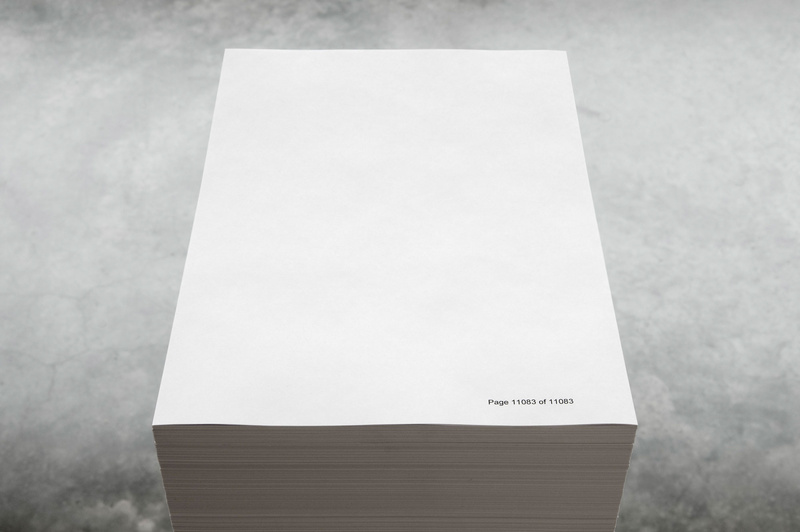 I’ve posted about the plain white page as art here before (both in terms of Martin Creed’s use of A4 copier paper and Jack Brindley’s handmade paper) so it’s interesting to also think about Floyer’s work Page 11,083 of 11,083 in which 11,083 (presumably, I was hardly in a position to count) sheets of numbered copier paper become, well, what exactly? A column? An empty plinth? 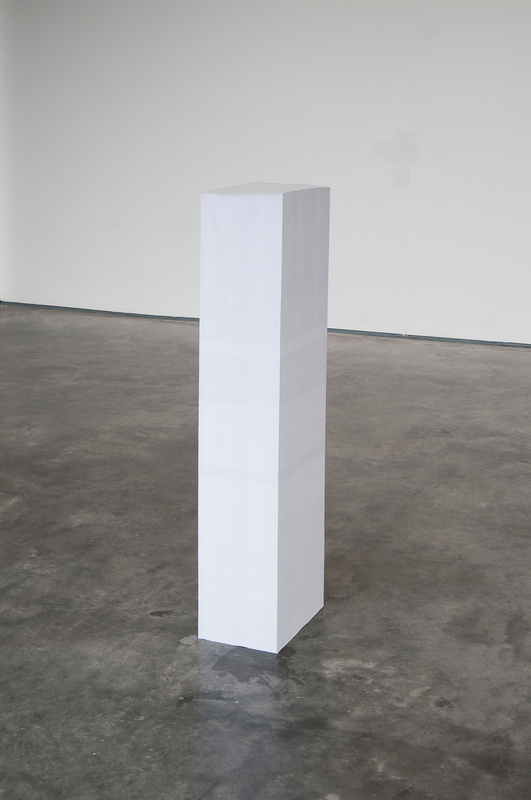 Either way, the neatly stacked paper becomes an object in the space: (almost) blank paper as sculpture. In a way I find this work alarming. One clumsy mis-step and its form would be altered to 11,083 (presumably) pieces of paper littering a gallery floor. That would be very bad. But it’s also intriguing. Often in a gallery space a stack of paper is an invitation to take a sheet away. It’s very clear that this is not the case here, but I also wonder whether anyone is tempted. And, of course, there’s that text: printed neatly in the corner (in the footer area, in a format that suggests that, as well as sculpture, this might be a 11,083 page Word document saying very little): Page 11,083 of 11,083. This is it, the complete set. But of course, there’s no way to be sure. Is the pile really just over eleven thousand sheets high? Is each sheet numbered? Are they stacked in order? While I can assume that they are, I have no way of telling and both the ambiguity and my assumption of Floyer’s ordered completeness please me. This could so easily come across as rather dry, conceptual work but, as with Monochrome Till Receipt, there is a lightness of touch that makes Facsimile and Page 11,083 of 11,083 easy to enjoy. This entry was posted in Conceptual art, Film/Video, Sculpture and tagged art, Ceal Floyer, Facsimile, Page 11083 of 11083, sculpture, video, white by Ann Jones. Bookmark the permalink.